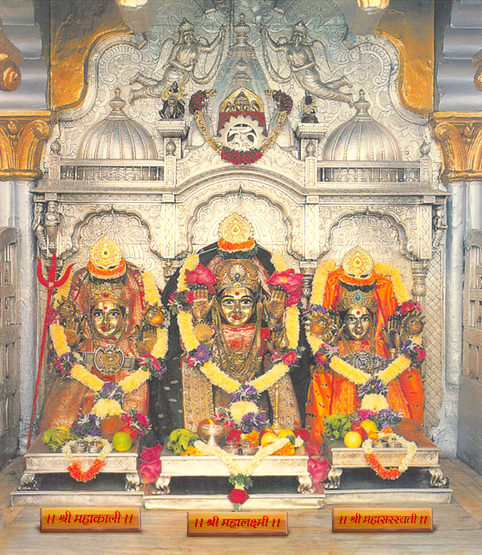 The Tridevi (English: three goddesses; Sanskrit: त्रिदेवी, tridevī) is a concept in Hinduism joining a triad of eminent goddesses either as a feminine version of the Trimurti or as consorts of a masculine Trimurti, depending on the denomination. This triad is typically personified by the Hindu goddesses Saraswati, Lakshmi, and Parvati. In Shaktism, these triune goddesses are the manifestations of goddess Yogmaya also known by the names of Adi Parashakti, Devi. In the Navaratri ("nine nights") festival, "the Goddess is worshiped in three forms. During the first three nights, Parvati is revered, then Lakshmi on the fourth, fifth and sixth nights, and finally Saraswati until the ninth night." Whereas in androcentric denominations of Hinduism the feminine Tridevi goddesses are relegated as consorts and auxiliary deities to the more eminent masculine Trimurti gods, in the Shaktidharma denomination the feminine Tridevi goddesses are given the eminent roles of Creator (Mahasarasvati), Preserver (Mahalaxmi), and Destroyer (Mahakali), with the masculine Trimurti gods being relegated as the auxiliary deities as agents of the feminine Tridevi. Saraswati is the goddess of learning, arts, and cultural fulfillment, as well as consort of Brahma, the creator. She is cosmic intelligence, cosmic consciousness, and cosmic knowledge. Lakshmi is the goddess of wealth, fertility, and material fulfillment, as well as consort of Vishnu, the maintainer or preserver. However, Lakshmi does not signify mere material wealth, but also abstract prosperity, such as glory, magnificence, joy, exaltation, and greatness. Parvati, or in her demon-fighting aspect, Kali, is the goddess of power, beauty, love, and spiritual fulfillment, as well as consort of Shiva, the destroyer of evil or transformer. She also represents the transformational power of divinity, the power that dissolves the multiplicity of the Hindu gods into their unity. She is a direct incarnation of Adi Parashakti. Shakti or Vimarsh is the power that is latent in pure consciousness, required to reach pure consciousness and essential to create, sustain and destroy. Just as Energy can never be created nor be destroyed, but changes from one form to another; Devi took many incarnations to do different tasks. God is both male and female. But all different forms of energy or powers of God are with the Trimurti in the form of Mahalakshmi, Mahasaraswati and Mahakali. That is to say, a non-dimensional God creates this world through Srishti-Shakti (Mahasaraswati or Sound or knowledge), preserves through Sthiti-Shakti (Mahalakshmi or Light or resources), and destroys through Samhara-Shakti (Mahakali or Heat or Strength). It is also seen that God cannot create, generate or destroy because God does not possess any attribute. So True Energy or Adi Shakti does everything on God's behalf. Via Buddhism and syncretism with Japanese Shinto deities, the Tridevi entered Japanese mythology as the goddesses Benzaitennyo 弁財天女 (Sarasvati), Kisshoutennyo 吉祥天女 (Laxmi), and Daikokutennyo 大黒天女 (Mahakali). ^ "Navaratri", in Hinduism Today magazine, October/November/December 2008. This page was last edited on 10 April 2019, at 19:22 (UTC).